With the popularity of Mad Men and recent period movies, the slick, parted, well-groomed styles seem to be making a comeback. Styles with side parts, combed back tops, and cleanly tapered necklines are popping up everywhere. These styles are normally worn with a liberal does of high-shine pomade, but what if you want the style without the wet look? 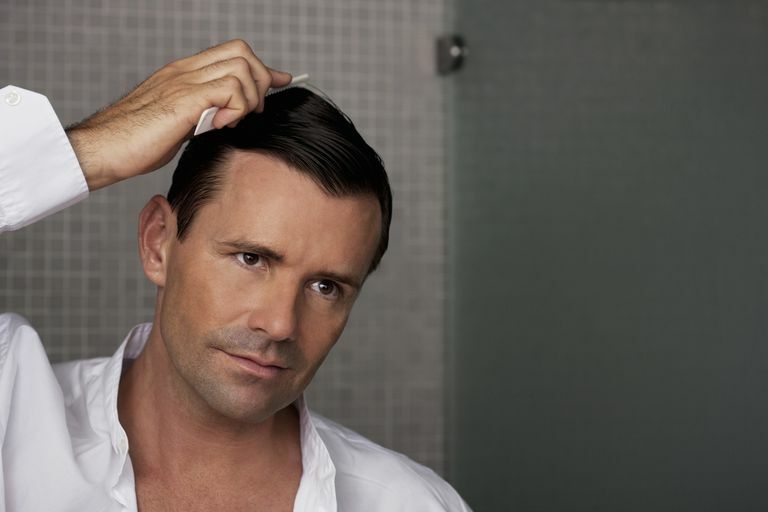 Achieving that well-groomed dry look is actually VERY simple. After washing and towel drying your hair (while it is still slightly damp) apply a fairly liberal amount of firm hold gel (or light hold if your hair is fine). It's important to use a great, professional quality gel that won't flake. For this purpose, I recommend American Crew Firm Hold Gel (there's a light version for fine hair). After distributing the gel evenly throughout your hair, comb into place and let it air dry completely. Once the hair is dry, simply run a comb through it (combing it into the same shape you created while wet) and you've got the dry look. The gel will "remember" the style so the hair retains it's shape. To ensure it stays in place, simply apply a very light application of dry look hair spray (Redken for Men Hold Still Spray is a good option). That's it. No blow dryer or fancy technique needed to achieve that dry, well-groomed look. 7 Men's Styles That Beg the Question Business on the Sides, Party on the Top?